We begin today with a clear and milder sky. Most neighborhoods need jackets with lows in the lower to middle 50s. Some cities like Pittsburg, Antioch, Brentwood and Tracy won't escape the 60s. Total sunshine and a warmer start push high temperatures to near record levels around the Bay and Inland. A light offshore breeze brings 70 degree highs to the Coast and near on the Bay side of San Francisco. Cool lows in the 50s tonight save us from overheating. Look for a few areas of fog near the Coast tomorrow morning. 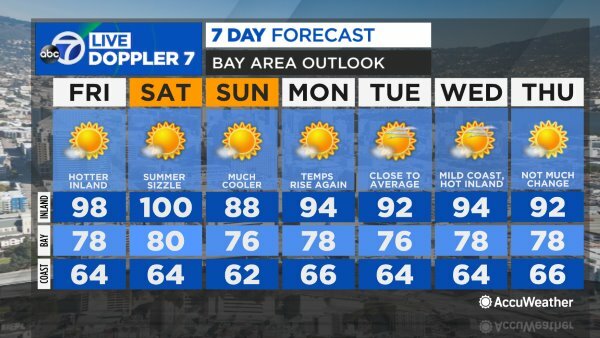 Bay and Inland neighborhoods try to reach record levels again tomorrow. The sea breeze brings cooler weather to the Coast and San Francisco.